Come and hear an introduction to this important book, followed by discussion with the author Clare Land. Based in Melbourne, Clare is a non-Koori activist and researcher who wrote Decolonizing Solidarity based on interviews with Aboriginal people in the southeast of Australia who have pursued land rights, black power and sovereignty, and their supporters. The book draws insights from a wide range of anti-colonial and anti-racist writings and is also grounded in Clare’s own sense of the politics of solidarity developed through her work alongside with Gary Foley (Gumbainggir) and Robbie Thorpe (Gunai/Maar) over the last 15-20 years. The book aims to inspire, support, trouble and give direction to the work of non-Aboriginal people who support Aboriginal struggles. It also speaks to Aboriginal community members who are grappling with the work of nurturing and challenging their supporter base. The book was published by Zed Books (London) and first distributed at the 2015 Anarchist Book Fair in Melbourne. It has found a wide readership amongst anarchists, greenies, teachers, social workers and beyond. Film and discussion! 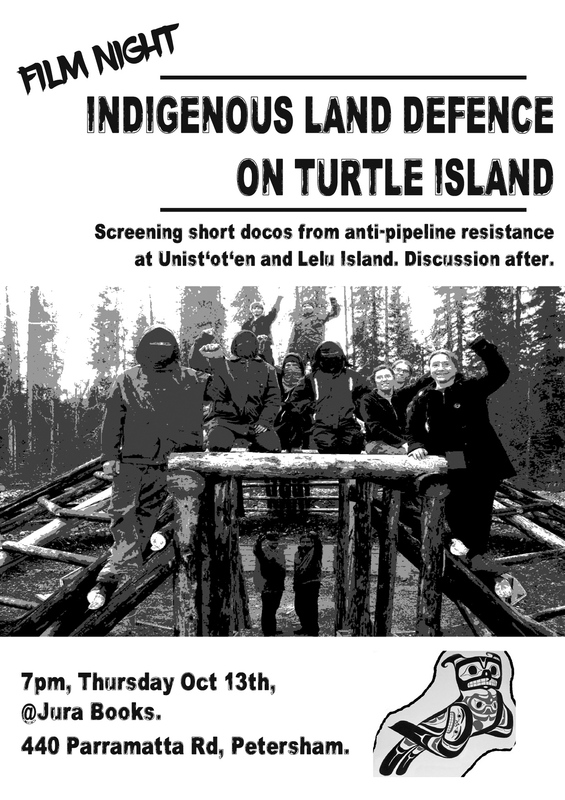 We’ll screen a few short docos from anti-pipeline resistance at Unist’ot’en and Lelu Island. Followed by discussion hosted by a (non-Indigenous) comrade who was recently in Canada. All welcome! Food and drinks by donation. In conjunction with Ojos De Perro, the makers of the film, an international screening on Mon 26th September of the Mexican documentary "Watching Them Die: The Mexican Army and The Disappeared 43" will be happening at Jura. It's about the killing and disappearance of 43 students in Ayotzinapa Guerrero (and other thousands of Mexicans through the years) by the Mexican army. The government has protected the culprits and masked the truth, the journalists are trying to spread their independent work in Mexico and the world. Doors open at 6:30pm with the screening to start at 7:00pm. Frantz Fanon predicted that if national liberation movements win independence but go no further than assuming the reins of the nation-state – an apparatus of rule inherited from Europe – then the resulting regimes will be no less despotic than the departed colonial masters. Before Fanon, too, there was the irrepressible Russian anarchist, Mikhail Bakunin, who argued, contra Karl Marx, that a post-revolutionary society that failed to do away with the state would only perpetuate tyrannies that Marx and his followers claimed to oppose. The twentieth century proved both Bakunin and Fanon right, thereby prompting new explorations into what revolution without the state might mean. This talk will offer a glimpse into one such exploration in the Philippines – a unique case, though very much in line with anarchistic resurgences everywhere – while also highlighting the complementarities between anarchist and postcolonialist perspectives. The talk will be given by Marco, an anarchist from Perth who has spent quite a bit of time with anarchists in Manila. Followed by discussion. All welcome. Free.